And finally, quite the most complicated ending of any of London's lost rivers. A series of tidal ditches ran towards the Thames, dug courtesy of the monks upriver at Bermondsey Abbey, and forming a roughly rectangular grid. Originally the surrounding land was taken up with orchards and market gardens, but by the late 17th century a dense commercial area of factories, warehouses and mills had grown up. The area became known as Jacob's Island, a 'rookery' where the poorest folk lived side by side with polluting waste in slum conditions. By Victorian times the lower Neckinger was nicknamed "The Venice of Drains" and "The Capital of Cholera". Dickens immortalised the place as the final refuge of Bill Sikes in Oliver Twist ("dirt-besmeared walls and decaying foundations; every repulsive lineament of poverty, every loathsome indication of filth, rot, and garbage; all these ornament the banks of Folly Ditch"). If you'd like to know more about Jacob's Island, Howard has the definitive webpage.  All my Neckinger posts, in the right order. 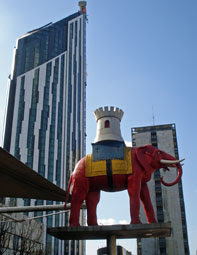 It's hard to imagine Elephant and Castle as a rural riverside backwater. But 250 years ago, then known as Newington Butts, this was a quiet lane on the edge of St George's Fields forded by a small stream. The Neckinger flowed in from the west through the 'Fishmongers Almshouses' - soon to be demolished to make way for Spurgeon's Tabernacle (now a firmly evangelical hotspot) [photo]. It crossed a small village green, long since buried between E&C's two mega-roundabouts. And then it passed east between a row of cottages, now the site of the much derided pinky-red shopping centre. The transformation here is dramatic. The only flow now is of people, bustling around the double-decker mall in search of nothing very expensive [photo]. Here the less-than-affluent folk of Walworth come to buy stuff no rejuvenated hub would ever sell, be that substandard market millinery or a polystyrene tub of goat stew. Outside the front entrance a turreted elephant stands guard, positioned almost directly on the line of the old stream. And high above rises the nearly-complete Strata tower, its trademark turbines relatively well concealed from the streets below [photo]. Next along the Neckinger valley comes the Heygate Estate. If you thought the shopping centre was grim, this similarly-dated architectural project beats all. A series of residential "barrier blocks" surround the site, each ridiculously long and crammed with stacked-box accommodation [photo]. The various parts of the site are linked by elevated walkways, while ground level is reserved for the parking of cars. No wonder Southwark Council took a long deep look at their creation and decided the the only way forward was to demolish all 25 acres. Tenants started being moved out two years ago, and the Heygate now resembles a ghost estate inhabited by a last few lonely souls [photo gallery]. Every abandoned window is being blow-torched shut, and every quarter-mile balcony sealed off at either end [photo]. And yet there's still full access to the walkways and stairwells, not just for the remaining 5% of residents but for any urban adventurer who fancies poking around abandoned concrete purgatory [photo]. But hurry, if you think you're brave enough, because it won't be too long before proper demolition begins and this inhuman jungle is reborn as aspirational Heygate Boulevard. The Neckinger followed the line of the New Kent Road before passing just to the north of the Bricklayers Arms gyratory and passing into Bermondsey. It ran immediately behind Tower Bridge Road, in an area once the preserve of large scale industry. Hartley's built their jam factory on the former riverbank in Rothsay Street, employing more than 2000 locals to squish sugary fruit into glass jars. It'll not surprise you to hear that their plant is now a gated residential development called The Jam Factory, retaining the Hartley name only in white bricks across one wall and down a chimney [photo]. Another pocket of ultra-modernity can be found just downstream at Bermondsey Square. Look one way and it's a bijou plaza with its own hotel, micro-cinema and pavement cafe [photo]. Look another and it's a glittering bikeshed surrounded by mysterious multi-coloured icosahedrons [photo]. But look south and one defiant corner of Georgian terrace remains... and that's still the side of the Square where anyone with taste would prefer to live. At St Mary Magdalen church [photo], the Neckinger turned right. Despite being more than 300 years old this isn't Bermondsey's oldest place of worship, not by a long chalk. Nearby stood Bermondsey Abbey, a Cluniac priory dating back to the Norman invasion, and at one time second in importance only to Westminster across the Thames. 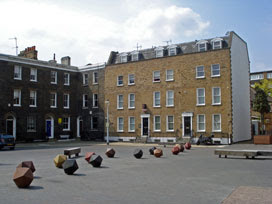 Bermondsey Square marks the site of the monks' inner courtyard, while the main church building straddled modern Abbey Street to the east [photo]. The top end of the nave is marked by a commemorative plaque on the wall of a block of council flats overlooking Tower Bridge Road [photo]. Much of Bermondsey Abbey survived Henry VIII's dissolution, only to have its stone plundered for the construction of other local buildings over succeeding centuries. Today no trace remains, bar parts of a gatehouse along the western end of Grange Walk (lovely street, Grange Walk). As for the Neckinger, the stream was reputedly navigable all the way from the Abbey down to the Thames. Nearly there, only half a mile to go. 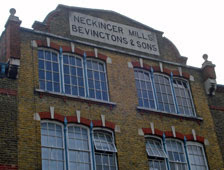 The Neckinger is Southwark's lost river. It earned its name from a macabre installation near its mouth at St Saviour's Dock where was erected a gibbet for the execution of convicted pirates. This became known as the Devil's Neckerchief, a nickname soon echoed by the river flowing out into the Thames. The Neckinger's headwaters rose two miles away on Lambeth Marsh, round the back of what is now Waterloo station. From here it flowed in a grand curve away from the Thames round to Elephant and Castle, then on to Bermondsey through the grounds of the former Abbey. The entire course is unusually flat, with not even the slightest hill at its source, which has led some to suggest that the Neckinger might possibly have been the leftover remains of an oxbow lake. That's probably wishful thinking by geeky geographers, but it might help to explain why the river was linked to the Thames at both ends via artificial channels. Of the three western conduits nothing survives, but a substantial chunk of manmade waterway still lives on downstream of Tower Bridge. Urban expansion swallowed the Neckinger faster than most other inner London rivers, so be warned that much of what I'm about to write is potentially inaccurate supposition. But I'll try to guide you along its two mile length as best I can. Lambeth Marsh, across the Thames from the Palace of Westminster, remained mostly fields until the end of the 18th century. A raised road ran through the centre along which houses and businesses prospered, but the surrounding meadows flooded with predictable regularity. Only in the late Georgian era were the market gardens sold off piecemeal for development, and the arrival or Waterloo station in 1848 sealed the area's fate as yet another swathe of urban London. Drainage to the south had been provided by the Neckinger, whose reputed source was a pond on Lambeth Road at the edge of St George's Fields. A public house was established here called the Dog and Duck, named after two neighbouring ponds whose outlines allegedly resembled the beasts in question. 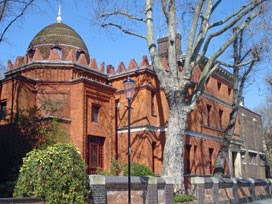 Close by was established the Bethlem Royal Hospital, an infamous asylum whose buildings are currently home to the Imperial War Museum [photo] [photo]. There are no pubs or ponds in Geraldine Mary Harmsworth Park today. 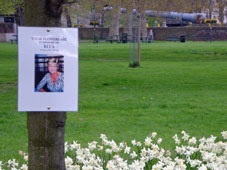 Instead the northwest corner of the park is covered by flowering bulbs planted in memory of "Rita, the lady with the little dog". Here too little wannabe soldiers run amok on the grass, at least until their parents drag them inside the museum for a look at the big guns. There's no sign either of the three artificial millstreams dug to feed water between the Thames and the Neckinger here in the heart of Lambeth. One started under Waterloo Bridge [photo] (not that the bridge was there at the time), then progressed inland through the auditoria of the National Film Theatre (ditto). Past the IMAX and the rail terminus along Waterloo Road, then past the end of Lower Marsh (which did actually exist at the time) to join the other channels near the Ambulance Station on Great Morley Street. A second ditch left the Thames between Blackfriars Bridge and the Tate Modern [photo], following the orange lampposts down Suffolk Street to the cabbies' haunt on the corner of Surrey Row. 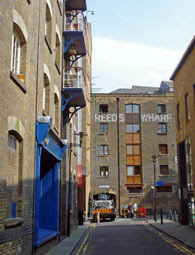 And the third ditch started between Coin Street and the Oxo Tower [photo], running due south down Hatfields past the Young Vic. It's amazing how many lost rivers live on as modern boundaries. This third artificial channel, the central of the trio, can be traced today by following the boundary between the boroughs of Lambeth and Southwark. Sure there have been a few administrative tweaks over the years, but council tax rates in the neighbourhood are ultimately dependent on the location of a Georgian ditch. This dividing line continues past the Neckinger's source-pond at the end of King Edward Walk, then hugs the appropriately named Brook Drive round to the east. Today's boundary may finally veer off before this elegant terrace reaches its end, but the Neckinger once continued to the very heart of the Elephant. For a brand new railway, south of the river very little has changed. Walk into New Cross Gate station and you'd hardly notice that the East London line's here at all. No signs in the street, no directions in the ticket hall, not even any special orangey livery on the platform. The only obvious clue that a new rail service has arrived is the bright yellow train [photo], but don't expect to be told where it's going or in how many minutes it departs. Southern Railways appear to show no interest whatsoever in the Eastern interloper recently returned to their platforms. Best hop aboard ("Please stand clear the doors") and speed away. The trains may be new, but the interior's not lovely. More like a cattletruck on wheels than even the bleakest tube or bendy bus, these carriages are clearly designed to cram in as many vertical passengers as possible. Whenever there are more than 150 people on the train then somebody's going to have to stand, but at least if rush hours ever meet full potential then nobody should be left on the platform. It was apparent this afternoon that most of the travellers were enthusiasts rather than commuters [photo], as they spent most of their time looking at the carriage walls or out of the window, rather than at a newspaper. Passenger trains from New Cross Gate run alongside a fenced-off squeezed-in depot, then on past the heavily engineered junction where trains will one day veer off towards Clapham. Surrey Quays is the first station where all lines converge. It still looks remarkably similar to how it did before the line shut, apart from two bold white staircases built as emergency exits because Mr Health & Safety dictated. Canada Water genuinely is exactly the same as before, except that the curves in the platform roundels are now Overground Orange. Smiling locals can again alight at Rotherhithe, delighted to have their commute restored after so many lost months. Trains rumble once more through the Thames Tunnel, not that anybody staring out of the window could discern any of its historical splendour in the inky blackness. And Wapping's open too, despite long-ago fears it'd have to close because the platforms were too narrow. Instead the biggest problem here is that nobody's yet erected any station nameplates at the far end of the platform, so passengers in the first carriage get no clues whatsoever as to where their train's just stopped. Passengers on the District Line platforms at Whitechapel are similarly in the dark. Most have yet to notice that the strip of tape across the downward staircase has been removed, and that the revamped East London Line is now open for business. 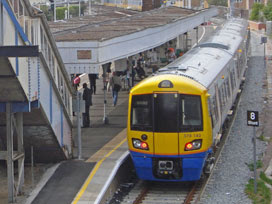 The ELL's platforms aren't especially revamped [photo], although there is a fresh footbridge which forces Shadwell-bound travellers on a up-and-over long diversion. And the cretins have been out, installing a brand new "next train indicator" so close to an exit sign that running information is totally concealed from half of the northbound platform. Never mind, there'll be a train along within eight minutes. 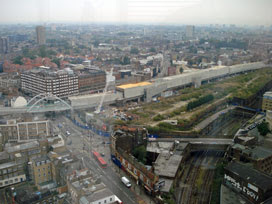 Where Shoreditch station used to be, the track now bursts above ground past a City Farm and across Brick Lane. But the daylight doesn't last long, as trains hurtle into the gloomy concrete tube at Shoreditch High Street. This is perched awkwardly in the middle of nowhere, and the ticket hall and stairs are large enough to accommodate rush hour crowds from office blocks not yet even on the drawing board [photo]. As for the station platforms, they're defiantly uncharismatic [photo], and only a lover of brutalist chic could ever find the place even vaguely attractive. Wheels screech west, gearing up for a rooftop ride across the streets of Hackney. This is the proper new bit (apart from the fact that trains ran here as recently as 1986 and it's just cost a billion pounds to put them back). And the view is great, especially at Hoxton station which has the best vantage point on the line. The Geffrye Museum in particular looks delightful from above, like a long village hall airlifted into the urban maelstrom. The City's skyscraper cluster is perfectly framed behind curved track to the south [photo], while the northern rails run arrow-straight along the viaduct [photo]. Haggerston's architecturally similar, at least at platform level, but with an intriguing loopy mural downstairs beyond the ticket hall [photo]. The station's not yet even vaguely busy [photo], but there are plenty of staff ready to sell you a ticket or to point you in the right direction. Both platforms here (and indeed elsewhere along the line) have their own dedicated "bloke with a megaphone" [photo]. These are friendly souls who announce everything the automated announcements do, but with a smile. I had a very pleasant chat with two of them, each clearly delighted to be part of a successful new enterprise (and to finally have real passengers to talk to). Next stop Dalston Junction [photo], where this train terminates. The track slowly descends back to ground level, and eventually below, before terminating in a gleaming subterranean vault. Actually only two of the lines terminate, while two outer tracks run on past big red stoplights towards Highbury and Islington. They'll be properly connected next year, which'll give Boris another chance to nip out and celebrate with a photo opportunity. I missed all the hullabaloo this morning, and the enormous crowds who gathered to see off the first passenger train. Dalston was rather quieter by late afternoon, and not even the dripfeed of station-spotting photo-snapping enthusiasts could fill its surprisingly cavernous ticket hall. I don't know who first sat down and thought "you know, we should reopen the Haggerston viaduct and link it to Croydon via Wapping" but I salute their vision. Political will and engineering expertise have finally enabled the connection of communities that might otherwise have stagnated. I fear it may be some time before London reaps the benefits of any comparable investment. Who was on the first train? A new Overground line means a new tube map. It's not an especially widely-distributed tube map, because apparently it'll only be visible at stations on the East London Line. But it is now the only version on the TfL website [gif] [pdf], where it can be seen by folk from Hoxton to Hong Kong, so we'd better get used to it. The biggest change on the new tube map is, of course, the appearance of the new East London line. This runs rigidly north-south throughout, which is a nice touch on an otherwise wobbly diagram. Dalston gets a new interchange - which may look tempting but is in fact a 250m trek across two main roads. Shoreditch High Street is confirmed to be inside revenue-raising Zone 1, with Hoxton on the border between one and two. There are restored interchanges with the DLR at Shadwell and the Jubilee at Canada Water. And there's not a replacement bus service in sight. It's clear that this is a very temporary tube map with a limited shelf life. No stations south of New Cross Gate are shown, even though they're scheduled to be part of the Overground network in four weeks time. "Only show them what they need to know for now" - this would seem to be TfL's mapwork mantra. So it's baffling to see that they've not taken the same approach with another bit of the Overground - the lengthy stretch between Gospel Oak and Stratford. This is completely closed for the next four weeks, and yet it's marked on this short-term tube map as being very much open. Why? That new Dalston interchange turns out to be a sham until the end of May, and anyone hoping to change trains here will find themselves waiting for an infrequent/slow replacement bus service. Clutter spotters should note that the new tube map boasts six additional wheelchair blobs - five on the East London Line and one more out at Hainault. This makes more than 60 big blue blobs on the right-hand third of the tube map, marking out East London as the ideal home for any independent wheelchair-enabled traveller. But the ugly blue blobs have increasing competition from a new disfiguring nemesis - the little red dagger. There are little red daggers everywhere. They're being used at stations to indicate something unusual about their train service, but you have to look across to the map's key to discover precisely what that is. 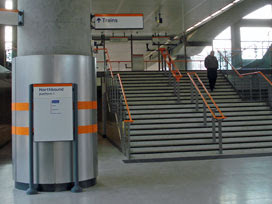 At Cannon Street, for example, the dagger means closed after 9pm and at weekends, whereas at Hounslow East it means step-free access for wheelchair users only. Daggerisation saves writing extra messages on the map itself, on which absolutely no words other than station names now appear. You might therefore imagine that this decluttering would be a great improvement - but I have my doubts. Bank station has a new dagger, although it's not immediately obvious why. All of the notes about stations are listed line by line - so there are five of these to check through before it's revealed that the dagger refers to early closure on the Waterloo & City. Meanwhile Blackfriars now has a new dagger to show that the station is closed, even though the station name has already been crossed out to show exactly the same thing. There may be a rationale as to why some stations have daggerworthy issues and others don't, but this remains somewhat baffling. If red crosses were only being used to show problems with individual stations this might not be so bad. But a bigger problem with the daggers, and to blame for 28 of the damned things, is that they're also being used to annotate entire sections of line. No service after midnight between Woodford and Hainault (one issue, three daggers). No early morning Piccadilly line between Rayners Lane and Uxbridge (one issue, six daggers). Diddums might have to change trains on the Northern line at Kennington (one utterly minor issue, seven bloody daggers). And the new East London Line is only open weekday daytimes (one issue, twelve stabby red things). Tube map daggers are nothing new - they've been on the ascent since last September. But the additional ELL cluster, plus freshly-positioned extras at Embankment, Blackfriars, Bank and West India Quay, give this symbol an increasing visual dominance. There are nasty red crosses positioned all over the place, scattered as if the map depicted some random cemetery. This is partly because no dagger actually appears alongside the station it refers to, only adjacent to its name (which in some cases is next to a completely different station). It's great that TfL have replaced all that previous squinty text, but red daggers really aren't the ideal solution. So if you're out enjoying the lovely new East London Line tomorrow, try not to look too closely at the new tube maps. They'll all be in the shredder within a month anyway. Only last month Boris delighted in announcing that an enormous lump of public art would be erected beside the Olympic Stadium. This sculpted tower of coiled steel will be called the ArcelorMittal Orbit (but only to people who write press releases), and has been designed by artist Anish Kapoor. At 115 metres from tip to base it'll be even taller than the Statue of Liberty, with a viewing platform two-thirds of the way up, and will be the landmark attraction of the 2012 Games. As a megastructure with the possibility of transforming the East End skyline forever, it clearly requires planning permission. And that planning permission is being applied for as fast as next month, which leaves a limited window for local people to have their say on whether they like it or not. As a very-local person, Arup have sent me a glossy letter in the post inviting me to come along to a public exhibition. On one side of the leaflet is a full-colour illustration of Kapoor's snakecharmer tower. Latticed cables erupt from the ground, rising to a defiant skyward hump. The liftshaft contains the only vertical lines, propped up on a curved base like a giant trumpet. Up top are two levels of observation lounge, linked to the ground via seven revolutions of descending ramp. Hundreds of tiny cartoon people mill around the plaza below, most of them conveniently wearing red to counterpoint the painted steel. It looks amazing, to be honest, although it may not look quite so amazing sat at the bottom of my road for the remainder of time. So I'll be going along to exhibition at the View Tube to find out more, if only because I suspect not many other people will. It's being hosted in a metal container in the middle of a building site. It's open for one Wednesday evening, one Thursday evening and one Bank Holiday Saturday. And it's a sham consultation, obviously, because the Orbit is going to get built whether local folk think it's an eyesore or not. There's a dedicated website with further planning information about the Orbit, which is here, although it's a bit light on detail. How tall is thing going to look, for example, from a variety of locations in the immediate and no-so-immediate vicinity? No clues, none at all. Fortunately there's also a feedback page where anyone can add their two'pennorth to the debate, and every comment will be included in London 2012's official planning submission. Unbelievably this is an anonymous process, with unverified identification via nothing stronger than the first part of your postcode. So there's nothing stopping people in Stornoway or even San Francisco from sending in their views, and pretending to be in E15 or E3, and maybe saying how much they love the Orbit even though they haven't got to live with it. Feedback notwithstanding, construction of the Orbit will begin later this year. It's going up on the site of the old Thornton Fields railway sidings, halfway between the Stadium and the Aquatics Centre, where it'll no doubt become very visible very quickly. Then from 2012, for a fee, anyone'll be able to visit the Olympic Park and snoop down across my end of London from umpteen metres up. Meanwhile I'll be staring back from my flat at this red metal intruder poking defiantly into the sky, wondering whoever allowed Boris to plonk it there. Please, world, feed back carefully. 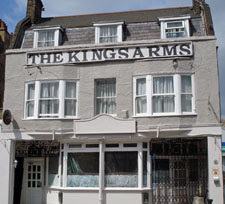  Kings Arms update: I wrote last summer that the Kings Arms pub in Bow Road appeared to have closed down. The building then went very quiet until earlier this year when builders arrived and started doing the place up. I realised the worst - no more pub - when I peered in through the windows and saw partition walls and a staircase where the bar used to be. This week the new owners have even painted over the characterful "Kings Arms" lettering on the front of the building and replaced this with a wonky ill-judged aberration whose letters are already peeling off. The full name of the new business is only revealed in a tiny amateur sign in the window, inkjet-printed from a single sheet of A4 paper. This has been chopped into strips and stuck with tape not quite horizontally to the glass, and mutely announces the arrival of the "Kings Arms Guest House". As rebranding goes, this is woefully inept. The 2-star guest house has yet to open, but already has a web presence written by incompetents: "Kings Arms Guest House is a newly refurbished bughet accomodation that has excellent connectivity due to its prime location that suites to the Olympic Site officials working at Stratford, Banking & Business sector community of Canary Warf & Excel Centre and the tourists travelling to Central London visiting places." Another pub bites the dust, stripped and gutted to meet the 21st century business paradigm. Only the landlord of the Bow Bells opposite might raise a glass to that.  488 bus update: Good news for Hackney/Bow residents who use the 488 bus to get home from Tesco. TfL have tweaked the 488's southbound destination, truncating the route by two stops so that it now terminates outside Tesco in Hancock Road. This means that northbound buses now start from Tesco, allowing elderly shoppers to hop on here rather than having to lug their bags on a long trek under a dual carriageway. This greatly improves on TfL's previous (whispered) advice to pensioners to stay on the bus to Twelvetrees Crescent, wait while the driver stopped off for a fag, and then continue back up to Roman Road. It's only taken 2 years to get back the looped service lost when the S2 was withdrawn in 2008. Except this isn't quite the perfect solution. The southbound 488 now terminates one stop short of Bromley-by-Bow station, which means that a direct connection between bus and tube has been lost. Meanwhile each northbound bus stops at Bromley-by-Bow station twice, once on each side of the dual carriageway, which is pointless overkill. It seems that TfL have prioritised access to Tesco over access to their own tube station. Why am I not surprised?  Bromley-by-Bow Tesco update: Planning permission is now being sought for the development of an utterly ginormous Tesco just to the south of the existing superstore. A revised application is up on the Tower Hamlets website, and there's very little time to object. It's hard to see what's changed since the last lot of plans, which were damningly described as "incoherent" and "piecemeal" by government advisory body CABE. In particular the Tesco store still gets the prime spot by the river, while the residential blocks and multi-storey hotel are fated to stare out across the noisy smelly A12. They also want to divert northbound buses so that these serve the new store rather than the existing community. It's easy to see what benefits Tesco get from the redevelopment, but I fear that their priorities are about to ride roughshod over an ideal solution for local residents. A planning decision like this only gets made once, but we'll all have to live with the consequences for decades. As a long-term devotee of Extreme Easters, I feel it's my duty to point out that next Easter will occur precisely one year from today. That's Sunday 24th April 2011, which for anybody below retirement age will be the latest that Easter has ever been. There's only one later date that Easter can be, which (obviously) is 25th April, and that hasn't happened since 1943. Which means that next year we're in for a ridiculously late Easter weekend, which ought to coincide with lovely Spring warmth but will probably be a freezing washout because life's like that. This also means that patriotic flag-waving Anglophiles are finally going to get their wish, and St George's Day will at last be celebrated over a bank holiday weekend. Sure George'll have to share the limelight with some back-from-the-dead Palestinian, but that won't stop red-faced white van men from having celebratory barbecues and getting pissed. This unofficial Dragon-defeating holiday will be a one-off, unless a new jingoistic government decides to increase the spring bank holiday logjam by adding another. Otherwise Englishfolk are going to have to wait until 2038 for a proper St George's Day Holiday, although that'll coincide with off-licence restrictions and early pub closure because it'll also be Good Friday. In the meantime I'm very much looking forward to an Extreme Late Easter next year, because that means the longest Creme Egg season ever. Let's hope it's not so hot by late April that all the chocolate melts. Saxmundham: Albion Street. A row of brick terraces. The barriers warble, and a lady shopper hurries through before they descend. A train approaches, slowing gently past the signal box into a sun-blessed platform. Passengers tumble out, some with backpacks, one led patiently by a guide dog. In the car park, diverse journeys continue. One lady arrives beside the guard's van too late and argues in vain to be allowed aboard. The next train's not for two hours, so she's a long wait ahead. 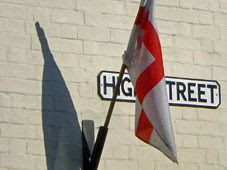 Down in the High Street every shopfront sports the flag of St George. Together they make a patriotic statement, but for now each hangs limply in insufficient breeze. Many of the shop windows have special red-and-white displays as a badge of celebration and allegiance. A draped pennant, a vase of roses, a knitted dragon, a teddy bear in an England shirt. The townsfolk of Sax are partying for George this weekend, and everyone's included. There's a Punch and Judy for the kids tomorrow, a Roast Beef dinner in the evening, plus a formal civic parade through the streets on Sunday. Meet by the Market Hall at 3pm sharp, and see you back afterwards for the Women's Institute tea. Aldeburgh: This is Britten's England. A classical haunt by the sea. Here one of our most famous modern composers made his home, in the Red House overlooking the heath, shacked up with his favourite tenor. April's the start of the tourist season, and the visitors duly come. They park on the sea wall at the neck of a ten mile shingle spit, down which no mere citizen may proceed. Instead they sail their yachts in the diverted river, or potter about in the bookshops and tearooms, or buy tickets for a very English opera. The fish and chip shop does a roaring trade, doling out moist greasy parcels with "do not feed the seagulls" printed on the front. For those who fancy frying themselves, fresh-caught cod is available in wooden huts strung out along the beach. The seafront, and the lanes behind, are stacked with pink and yellow cottages. On a late April weekday, the promenade belongs to the happily retired. Far up the beach, further than most will walk, a giant metal scallop erupts from the shingle. Is it art or is it eyesore? The community is split, but most visitors believe it does Britten proud. Thorpeness: He thought Southwold was "too vulgar". He wanted a resort with class and style. So Stuart Ogilvie came to Thorpeness, 100 years ago, and built himself England's first holiday village. Here he constructed a fantasy collection of mock Tudor cottages, with fake Jacobean infill, and used them all as holiday homes for friends and family. No building was quite what it seemed. Most outlandish of all was the disguise erected around the village water tower, which was clad to look like a five-storey house with a red cottage perched on top. It still pokes above the treeline, beside the windmill, and overlooking the three-foot-deep boating lake. Oglivie's once private enclave is now a public concern, ideal for short trips and long stays. On the village green, the Dolphin pub serves up "Roast and crumble" for less than a tenner. On the Meare, scores of brightly-painted rowing boats are identified by girls' names that are no longer popular. And in the waterside café, if you don't fancy Suffolk ham, chips and beans, the cream teas slip down a treat. Dollop of cream, dollop of jam, pot of leaves in water. Oh to be in England. 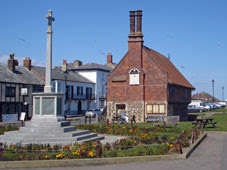 Aldeburgh: Scallop shell sculpture; Scallop shell with toddler; Moot Hall; Lookout Tower; Neck of Orford Ness. 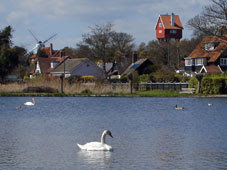 Thorpeness: The House In The Clouds; House In The Clouds plus windmill; the Meare boating lake; fantasy buildings. I live in a damned interesting constituency. It's one of only a handful of English seats whose MP doesn't come from the Big Three parties. Its current MP is a household name, even before he appeared on Big Brother. Nearly half of its electorate are Muslim, the majority of those of Bangladeshi heritage. It's a proper marginal, one of the tightest 40 constituency battles at the last election. And it could also be the only English seat the Labour party actually gains at the forthcoming election. Our current MP is George Galloway, who in 2005 swept to victory on an anti-war platform. He stirred up the electorate and promised Respect, then stayed away from the House of Commons and continued promoting his own agenda elsewhere. His reputation crumbled somewhat after asking Rula Lenska "would you like me to be the cat? ", and I for one will be damned glad to see the back of him in two weeks time. He's now switched nextdoor to stand in the ever-so marginal seat of Poplar and Limehouse, where his electoral interruption may yet allow riverside blue to beat council estate red. My best wishes go out to whoever beats him. The departure of celebrity leaves the BG&B electoral race up for grabs. Respect's replacement candidate is Abjol Miah, currently opposition leader on Tower Hamlets council (which tells you a lot about the highly unusual politics in my borough). Abjol's election leaflet highlights his local council record, and a left-leaning 'fighting' agenda. He also employs the age-old ploy of the "election leaflet bar graph" to show that there are only two parties in this race - Respect or New Labour. He's almost certainly correct, although a Respect MP would have virtually no power in the House of Commons unless Parliament ends up very hung indeed. Labour's fresh hope is Rushanara Ali, who used to work as an assistant to former MP Oona King. If the electorate abandons Respect and returns to type, she's likely to be voted in as the UK's first ever Bangladeshi MP. Actually it doesn't much matter which of the five main parties gets in, the UK's first ever Bangladeshi MP is already a dead cert. Rushanara's election leaflet is a fairly generic Labour glossy, and features a smiley photo taken outside Bethnal Green tube station. She says she wants to end division in the community, and reminds voters that she was born here, just in case they were wondering. Odds on Ali for May 6th? BG&B's not fertile Tory territory, especially now that Wapping's riverside wards have been hived off into neighbouring Poplar and Limehouse. Nevertheless the local Conservative party went to repeated efforts to select their candidate via an open primary. Second time of asking, and at a meeting over-represented by certain parts of the community, Zakir Khan duly got the nod. He's not got round to sending me a leaflet yet, but I understand crime and unemployment are high up his action list. Tower Hamlets had a brief spell as a Liberal stronghold around 20 years ago, but gains have been few and far between since then. Enter Ajmal Masroor, another 'local boy' (in birth, if not in current residence). He's not got round to sending me a leaflet yet either, but I gather he's a broadcaster (presenting on various Muslim channels) and part-time multi-mosque imam. Only a huge amount of Cleggmania could propel him to power, and round here that remains unlikely. The Green Party polled a decent core vote last time, and Farid Bakht will be hoping to build on that. He scores points for sending the tiniest electoral communication so far - a credit-card-sized policy primer that'll slip into the recycling with ease. And then there's everybody else. We have a lot of everybody elses in Bethnal Green and Bow, where the ballot paper on May 6th will be a mighty eleven candidates long. There's Hasib Hikmat, a local headteacher, who's invented his own party to "defend family values". Parents concerned about the number of fried chicken shops in the borough may, or may not, flock to his side. There's Alex van Terheyden who's standing for the Pirate Party (his focus is privacy and copyright, not parrots and plunder). There are three Independent candidates (see sidebar) who appear to have no internet presence whatsover. And then there's Jeffrey Marshall for the BNP, whose racist bile ought to sink without trace in a firmly multicultural constituency, but who will probably pick up several protest votes from electors thinking "but hang on, where are the British candidates?" For the second general election in a row I live in a damned interesting constituency. Let's see who picks up Galloway's mantle, and let's hope they actually bother to represent us in Parliament this time. And may the best Bangladeshi win. What are Overground staff doing before the East London Line reopens? That's easy if you're a driver - you ride an empty train up and down the line getting better at driving, and then you drive up and down the line again. That's easy if you're a signalman - you flash the lights on and off so that none of the still-practising drivers crash into each other. And that's easy if you're a building contractor - you wander around the almost-open stations tweaking the last bolts and screws before the public arrive. But what about the station staff, the ones employed to assist as-yet non-existent passengers? Until public train services finally get the go-ahead, it seems they're standing around bored with bugger all to do. At Shoreditch High Street, two customer-facing staff linger around the main entrance in case anybody wanders by. This isn't as likely as it sounds. The entrance to the station isn't on Shoreditch High Street, counter-intuitively, nor even on a road that intersects it. Instead the ticket hall faces out onto Wheler Street [photo] - a minor lane which has been boarded up for the last few years while construction continued all around. You'd not stumble across the entrance by mistake after a night out in trendy Shoreditch, not unless someone ever gets round to erecting several extra signs. But here the staff wait, happy to pass on information to would-be travellers as and when required. Behind them a row of ticket barriers stands idle, wide enough for some unimaginable rush hour, while an electronic departures board announces a string of uncatchable services [photo]. And beyond those a shallow staircase leads up to empty platforms (plus there's a lift, obviously, because there has to be). Shoreditch High Street is a super-ugly station, at least from the outside. It resembles a long sinuous concrete tube, but with an even longer concrete tube threaded inside. All the corners are squared off rather than rounded, and no attempt has been made to create anything of deliberate beauty. Instead this is a building designed to kickstart an economic whirlwind which will one day swallow it whole. The surrounding remainder of the Bishopsgate Goods Yard is scheduled for major redevelopment, probably a cluster of Shoreditch skyscrapers if certain councillors get their way. The plan is that all these buildings can be erected around the new station, safely tucked away inside its concrete cocoon, allowing rail services to continue if/when the towers go up. That extra-long inner concrete tube is to protect the ends of the platforms, thereby blocking out daylight for waiting passengers from Day One. Whenever that is. 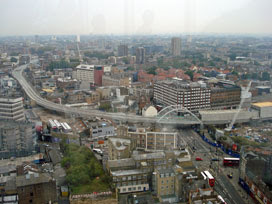 For Dalston-bound services, trains cross Shoreditch High Street over a bowstring bridge [photo] then gently rise on a curve round to the north. Here the railway links up with a pre-existing viaduct, formerly used by trains out of Broad Street, and follows this all the way to the end of the line. It's this elevated trackbed which has greatly reduced the cost of construction, removing the need for compulsory purchases or major demolitions along the way. Only a couple of sections of severed Victorian viaduct remain untracked, one still weed-strewn, the other with four artist-filled tube carriages perched on top. And finally, back at ground level, into Dalston Junction. There are two shiny grey entrances, one facing back into a not-yet-open bus interchange [photo], the other facing out on Dalston Lane [photo]. A modern housing development has gone up alongside, its stacked windows somewhat reminiscent of a game of Celebrity Squares. The ELL is a big deal here, bringing residential rejuvenation to one corner of the run-down town centre. Several staff are based at Dalston Junction, so it seems, most of whom currently spend their time lurking in the shadows at the top of the ramp. This gives the impression that the station is already up and running - a view confirmed by a map on the front hoarding which clearly states "line now open". But if you ask anybody here (or indeed anywhere else up the line) when the new service will finally open, they all give their best deadpan smile and offer the official answer of "May 23rd". It's true enough that trains to far-distant Croydon and Crystal Palace are still five weeks off. But the ghost trains to New Cross must surely open their doors to local passengers well before then, if only to give bored station staff something meaningful to do. Until then, East London's long wait continues. The East London Line returns? It didn't open over the Easter weekend. It didn't open last Thursday. It didn't open yesterday. But it must be opening soon, at least in part. There are staff milling around the stations. There are timetables up on view. They've even taken down the blue hoardings on the District line platforms at Whitechapel, leaving nothing but a flappy strip of yellow tape across the top of the stairs down to the Overground. That tape couldn't hold back a fly, let alone a surge of inquisitive passengers, so I can't believe it'll be in place for long. Surely the East London Line must open soon, maybe tomorrow, perhaps even today. And then, for sure, the entire face of pan-London travel will change. Sort of. They've been running a ghost service on the East London Line for the last month or two. Test trains have been whizzing empty from Dalston to all points south, just to make sure that signalling works and drivers know where they're going. You may even have seen the trains scuttling by, occasionally even stopping in stations, at surprisingly regular intervals. What started out as valuable training seems to have lingered on rather longer than is economically desirable, with passenger services have been held until station construction was complete. The final delay is apparently because on-board CCTV hasn't been working properly, and it would never do to run trains without anti-crime snoop-video in full effect. There was last a passenger service through the Thames Tunnel in December 2007. From Whitechapel down to the New Crosses, the trains were never frequent, never busy. A mere nine million passengers a year rode this way, well down on the 200 million plus who used the Northern line. Few people rushed to cross the river here, and those that did have all found alternative routes over the last two and a half years. Shoreditch station used to be one of the least used stations on the entire network, despite its prime position on cosmopolitan Brick Lane. And even the extension up to Dalston runs along a viaduct abandoned in 1986 because passenger numbers couldn't justify its survival. It's enough to make you wonder why TfL have gone to all this effort to spruce up and expand an underused railway backwater. In a time of austerity, isn't this just a complete waste of money? And the new line, well, it's not exactly useful, is it? It doesn't run into central London, so you'll not get anywhere popular without changing. TfL have sneakily tweaked the zone 1 boundary to tug Shoreditch High Street inside, so that it'll cost just as much to travel orbitally as it will to go through the middle. Meanwhile the Central line passes precisely underneath Shoreditch High Street station but nobody's found the money to create an interchange. It would be too popular, apparently, and clog up the Central line at peak times. Sorry South Londoners, but you're not going to be able to change onto the Central without making an entirely impractical detour. And then there's the lack of decent linkage at each end of the line. At the northern end the track runs out at Dalston Junction (which isn't a junction), leaving passengers with a trudge across the Kingsland Road to meet up with the existing North London line (which is currently shut). Down south they're reintroducing a split service, with half the trains venturing to New Cross and half to New Cross Gate. The central stretch may boast a 7½ minute service, but if you want a specific terminus you're going to have to wait up to quarter of an hour. New Cross may be useful for swapping to certain local trains, but far too many National Rail services speed through without stopping. And New Cross Gate isn't much of an interchange unless you want to go due south. Any attempt to switch west-ish towards Peckham or Streatham, not a chance. So is there any reason to celebrate the imminent reopening of the East London Line? Thankfully yes. It rejuvenates an under-resourced section of railway. It brings regular train services to a ill-served strip of poor old Hackney. It links both sides of the river, bringing the eastern half of the capital together. 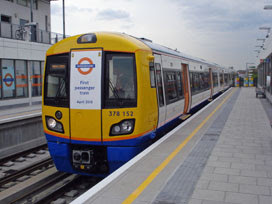 It connects communities, and speeds their passage direct to the DLR, Jubilee and District. And all this construction has actually been relatively cheap, far far lower in cost than Crossrail will ever be, making the most of tracks and viaducts that (mostly) already existed. Plus this only the beginning. A much fuller service kicks in on 23rd May, with more frequent trains continuing south to West Croydon or Crystal Palace, weekends included. Next year a northern link at Dalston connects the ELL to the NLL as far as Highbury and Islington. It's then predicted that passenger numbers will be as high as 33 million, not nine. And by 2012 there'll be an extra connection round to Clapham Junction, maybe even with an additional station at Surrey Canal Road. By this time frequencies on the main section will have increased to 16 trains an hour, and we'll have a complete orbital network around the congested centre of the capital. There'll be losers as well as winners, of course, as other services are scrapped or diverted to make way for the Overground's new trains. But, overall, East London life is about to get better. There are scores of sections of London railway which, when viewed in isolation, make no economic sense whatsoever. But link them all together into a dynamic transport network and a wealth of economic possibilities are created. Whenever you're ready, TfL, bring it on. 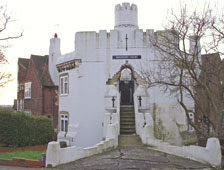 There are, as you may remember, some quirky magical houses in northern Brent. They were designed by Ernest Trobridge, a Kingsbury architect whose design beliefs lay somewhat outside the 1920s mainstream. His penchant was for homely, slightly magical dwellings perhaps better suited to an enchanted forest than a suburban estate. Trobridge's inspiration lay partly in his family's Swedish background, and partly in a desire to provide cheap well-designed social housing for post-war families. He used elm and bricks and thatch, because they were affordable, and installed shorter than usual flights of stairs so that cottages could be lower and more compact. Some of his more ornate designs included crenellations and turrets, most notably Highfort Court to which Sir John Betjeman paid tribute in his Metro-land documentary. Now there's an exhibition to this forgotten architect at Brent Museum, which you'll find upstairs in Willesden Library behind the automatic doors. Display panels relate Ernest's life, from his devout upbringing to his untimely death. Several of his original architect's drawings are on show, depicting floor plans and elevations, and there are a couple of mocked-up models too. I was pleased to find recordings from the folk who are lucky enough to live in his houses today, relating how their rooms may be awkwardly-shaped but who wouldn't want to live anywhere else. It's not a huge exhibition and won't take up much of your time, but the museum part's only the start. Pick up a free map and you can ride the Jubilee line to Kingsbury and search out Trobridge's finest for yourself - the fairy-tale houses on Buck Lane; the tasteful flats on Highfield Avenue; the Tudor-style cottage on Stag Lane; and his thatched retirement home on Slough Lane. You'd never spot them all without assistance from the map. Not unless you wait a month and join one of the museum's free guided walks, that is, or pop along to one of their evening talks (starting this Thursday). It's good to see one of London's quirkier minor heroes getting due recognition. When a media company seeks to celebrate the tenth anniversary of its broadband service you might expect something naff. Instead they've given London a temporary artwork made of laser beams and stashed it away in a dark warehouse behind the Oxo Tower. And it's rather fun. The installation's called Speed of Light and it's taken over the four storeys of the Bargehouse on the South Bank. A safety chat at the entrance ensures you're not fazed by strobe lighting, and aware that there might be dimly-lit trip hazards within, because they have to say that. And then the first gallery invites you to answer a question into a microphone. You'll discover why later. An exploration of the interior space follows, including several ascents of a dingy back staircase (I kept expecting Richard O'Brien to come running past me with six jump-suited adventurers behind). As your eyes get used to the dark, expect to see flashing laser beams zapping about across unseen rooms. The first one's pretty tame, more atmosphere than spectacle, followed closely by a red-beamed virtual living room complete with shimmering furniture. Look closely, it is indeed all done by mirrors. One long room has been taken over by two parallel metal rods, between which misty lasers dance to an electric soundtrack (the best view's from down one end, not stood in the middle). A redfaced icon shifts from smile to frown according to which way the light's reflected. And finally a roomful of shifting beams with a more frenetic accompaniment (I couldn't decide whether it reminded me more of military searchlights or an alien disco). The event's only on for two more days (today and tomorrow), so you'll need to hurry if you want to look at pretty lights in the dark. And don't worry, nobody tries to flog you broadband on the way out.